Karen ascends granite slabs low on the route. The route ascends gullies near Karen's left shoulder, then cuts left up the ridgeline to the summit. 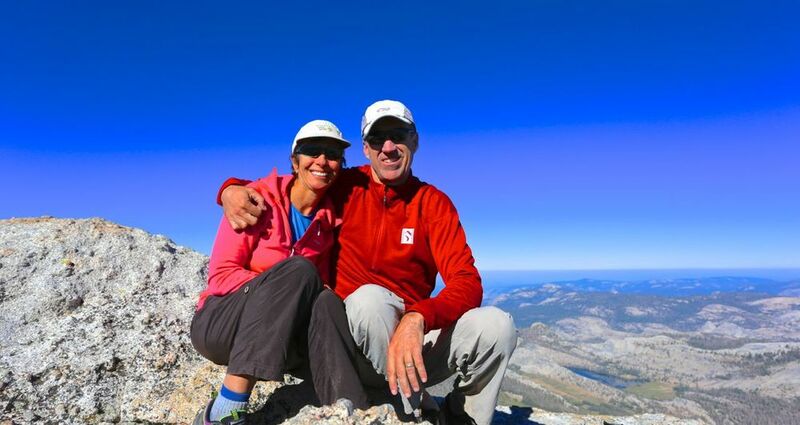 After I completed my hike on the Sierra High Route, which I will write more about soon, I spent a week in Tuolomne Meadows with Karen. I rested for a day and a half, and then we decided to head back into the high country to climb Vogelsang Peak. I had camped below the peak on my last night on the previous trip. It is a beautiful peak, though fairly easy to climb if you pick the right route. We snagged a permit from the backcountry office in Tuolomne, then packed up enough food for two nights. Our plan was to hike up to the base of the peak near Vogelsang Lake (about 7 miles from the trailhead) then camp and climb the peak the following morning. We knew it wouldn't take more than a few hours to finish the climb, so we planned to get back to camp, then move to beautiful Evelyn Lake to spend a relaxing afternoon and our second night. Vogelsang Peak on the approach from Tuolomne Meadows. Vogelsang Peak is 11,516 feet, and has two class 2 routes, plus several others ranging up to fairly long and difficult rock routes. We ascended near the center of the peak, hitting the ridge right of the summit, then descended down the left hand ridge line, all the way down to Vogelsang Pass, which is tucked behind Fletcher Peak (the large peak partially seen in the left foreground). The hike up to the lake was cool and sunny and got more alpine and beautiful with every step. The high country was shockingly dry (in late July 2013) from a very sparse previous winter. Rafferty Creek, which drains a large watershed near Vogelsang, was bone dry. Most of the meadows were covered in dry, golden grass that looked more like typical mid-fall conditions than peak summer. After a somewhat windy night we arose to perfect clear blue skies and chiily temperatures just above freezing. A leisurely breakfast and plenty of coffee delayed our start as the sun rapidly warmed us. Waiting for the sun to warm things up. Vogelsang Peak is quite popular due to its asthetic nature, great position in the heart of the Cathedral Range, and its proximity to the popular Vogelsang High Sierra Camp. Despite the perfect conditions, we were the only people on the peak that day. The best route up the peak takes a fairly direct line to the north ridge, aiming for a point several hundred yards north (right, from Vogelsang Lake) of the summit. This route is easier than it looks, with a little bit of routefinding as you near the final gullies just below the summit ridge. After some easy scrambling in the gullies, it's a simple matter to pick your way along the ridgeline to the summit. Nearing the ridge, Karen picks her way through slabs and up towards the crux gully. The view from the summit of Vogelsang Peak is spectacular. You get a nice view of the "back side" of Half Dome, and the upper flanks of El Cap. Much of the Yosemite High Country is spread out around you - Mathes Crest, Cathedral Peak, Fletcher Peak, the Lyell area peaks....too many to name, and many I don't know. The polished and rounded domes of northern Yosemite roll off into the distance, dotted by trees and and water, and beckoning for another day. After taking in all the view and sun we could, we decided to traverse down the south ridge and over to Vogelsang Pass, eventually joining a trail which would take us back to camp. This descent involves one moderately steep and loose gully, but is mostly gorgeous terrain and moderate hiking. This ascent/descent combination is highly recommended. The morning and position were so perfect that we went as slowly as possible, taking lots of breaks to look around at every lake and valley and far off glacier. Our final break was at Vogelsang Pass, where it was easy to see more valleys and ridges, tucked away from trails, and also tucked away in our minds for another day, and another summer. Karen on the summit. Half Dome is visible on the far right of the photo, seen from the back. A few stunted Whitebark Pines can be seen to the left, just below the summit blocks. Southern Arizona is blessed with diversity; high mountains, lush deserts, grasslands, multiple cultures, and incredible biological diversity. Even the occasional jaguar is still sighted every year or so, usually a male roaming up from Mexico, sadly in search of new mates that don't exist. Several small mountain ranges dot the southeastern corner or Arizona. They are high enough and cool enough to contain lush pine forests, while surrounded by desert and grasslands. These isolated patches of cool forest are commonly called "sky islands", a perfectly descriptive name. One of those islands is the Santa Rita mountains, located about 35 miles south of Tucson, and about 25 miles north of the Mexican border. This range is capped by Mount Wrightson, 9453 feet. Hiking Mount Wrightson is a great escape from the desert heat, and can be one of the best workouts in Arizona. It's just over 4000 vertical feet from the Madera Canyon trailhead to the summit, and it can be covered in 5.4 miles if you use the Old Baldy Trail. You can also use the Super Trail, which gets to the summit in a less steep 8 miles. These two trail cross at Josephine Saddle, at 7000 feet, allowing you a chance to mix and match the trails to your liking. On a recent trip with my daughter Megan, we made a short film of our hike, called Contrast. On that trip we were lucky to see a White Nosed Coati scamper along the hiilside as we prepared dinner at Baldy Saddle. In many years of hiking in southern Arizona, I've seen Coatis only twice - on this trip and once on Baboquivari. You are likely to see numerous bird watchers on the lower portions of any of these trails. Madera Canyon is a world famous birding spot, and home to the Elegant Trogon, a gorgeous bird which I have seen on the lower slopes below Josephine Saddle. I prefer to use the Old Baldy Trail because it is less exposed to the sun, and stays on the moist north facing slopes most of the way. And because I like the steep and fast ascent. Though usually done as a day hike, Mount Wrightson is also perfect for a one night backpacking trip. You can hike to upper Baldy Saddle at 8700 feet and camp at one of several decent campsites. From there you can climb to the summit at sunset, or the next morning at sunrise. Either is a great choice. Hiking from the upper saddle to the summit is about a 30 to 45 minute hike, covering the final 750 vertical feet. In winter this last portion of the climb can harbor a surprisingly large amount of snow, and some steep sections can also be very icy. Be careful. Though there is frequently water at Bellows Springs on the Old Baldy Trail, one mile below the upper saddle, don't count on it. Carry all the water you need, whether on a day hike or overnight trip. The trailhead is located at the road's end in Madera Canyon, at 5420 feet. There is a large parking lot at the trailhead. The Old Baldy trail exits at the upper right of the parking lot, while the Super Trail exits at the upper left. There are signs in the lot if you if have any questions about the trails. You will need a Coronado National Forest user permit to park. You can pay in a slot at the parking lot ($5 for one day) or get an annual permit at one of many locations in Tucson. The two main trails up Mount Wrightson are shown here; the Old Baldy Trail in red and the Super Trail in blue. The two trails cross at Josephine Saddle, and then join at Baldy Saddle. Above Josephine Saddle, the Super Trail gradually climbs around the south side of the peak, while the Old Baldy trail climbs steeply up the north side. There is one trail for the final climb from Baldy Saddle to the summit (shown in red). Mount Wrightson is a 4000 foot vertical climb from the trailhead, which can be covered in in 5 trail miles, or a more mild 8 miles, depending on the trail used. Lengthening shadows spread across Arizona as sunset approaches on the summit of Mount Wrightson. The summit of Mount Wrightson offers an expansive view of the many mountain ranges of southern Arizona and Northern Sonora, Mexico. This view looks north, with the Rincon Mountains in the distance on the left of the photo. For short trips, with predictable Arizona weather, we normally forego the tent and enjoy the stars. This camp is at upper Baldy Saddle, at about 8700 feet. Upper Baldy Saddle has several good campsites, but can be windy. Southern Arizona is well known for its clear night skies and good night time star gazing. Here Orion and a crescent moon set in the west, soon after sunset. With my daughter Megan on the lower slopes after an overnight trip. A 180 degree panorama from the summit of Humphreys Peak. The left side of the photo looks northwest, toward the Grand Canyon, some 70 miles away. The right side looks to the southeast, into the upper basin of the San Francisco peaks. 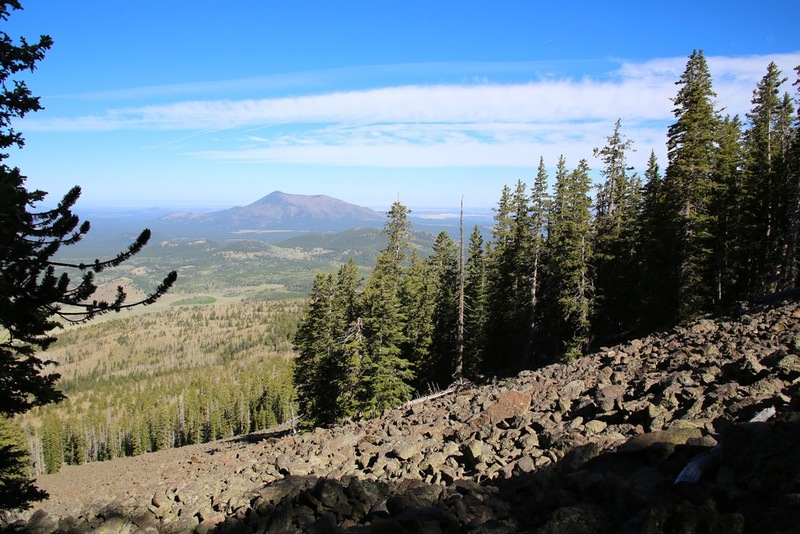 At 12,633 feet Humphreys Peak is not only the highest point in Arizona, it is also gives the hiker a great look at a volcanic caldera that stands alone amidst the high plateau of northern Arizona. Most hikers start at a trailhead adjacent to the Arizona Snowbowl, a ski area 11 miles north of Flagstaff. The trailhead is located at 9330 feet, on the left side of the road, just below the main parking for the ski area. The trail up to the summit is 4.8 miles and climbs 3303 vertical feet to the summit. After crossing through the ski area the trail disappears into dense coniferous forest and steadily switchbacks up the west side of the peak. You pass through some large stands of aspens, eventually climbing to thin stands of trees as you approach the ridge of the caldera at 11800 feet. The saddle is 3.8 miles from the trailhead and offers a sudden beautiful view to the east and down into the moist, aspen filled inner basin. Here the trail forks, with one trail heading to the summit, and another heading lower into the basin. You will turn left (north) and continue up through the only expanse of alpine tundra in the state of Arizona. The exposed summit ridge is notorious for high winds and is not the place to be in a thunderstorm. If it is cloudy or threatening, turn around and come back another day. The summit of Humphreys Peak has a grand view. On a clear day you can see the Painted Desert to the east, endless expanse of Ponderosa forest to the south, and thinly forested plateaus the lead north and west to the Grand Canyon. All around you is evidence of the volcanic history of the San Francisco Peaks. The main crater lies southeast of the summit and is surrounded by a ring of lower peaks. Multiple eruptions between 2.5 million and 400,000 years ago created the peaks we see today. We reached the saddle after 2 hours of hiking, and took a short rest. From the saddle, the trail quickly becomes steep, rocky and exposed. At times it walks directly on the summit ridge, but generally it stays slightly west of the right before crossing to the east side just below the summit. It is a vigorous and rocky mile from the saddle to the summit. I've heard numerous stories of horrific winds along this ridge. When I've been there it has always been windy, but never unmanageably so. There are numerous wind breaks built at the summit which make it easy hide from the wind. If it is 75 degrees in Flagstaff, expect to be wearing jackets and gloves near the summit. On this hike we spent a lazy hour on the summit absorbing the sun and the view. The hike down is steep and fast. We arrived at the car in less than 6 hours round trip. A great way to do this hike is to get up very early, timing your arrival at the saddle with sunrise. Then hike along the ridge to the summit as the sun warms up the air, eating a hearty breakfast on the summit, facing the warm sun of the new day. The first three miles of the hike zig zag through dense forest. In the early season (until mid-June) the upper part (from 10500' to 11200') of this forested slope can hold a lot of snow. Be prepared. Above 11200' the trail is more exposed and usually holds considerably less snow. Kendrick Mountain (10400') as seen from a massive talus field on Humphreys Peak. Kendrick Mountain is another great local hike. The summit ridge of Humphreys Peak, taken from the saddle at 11,800 feet. 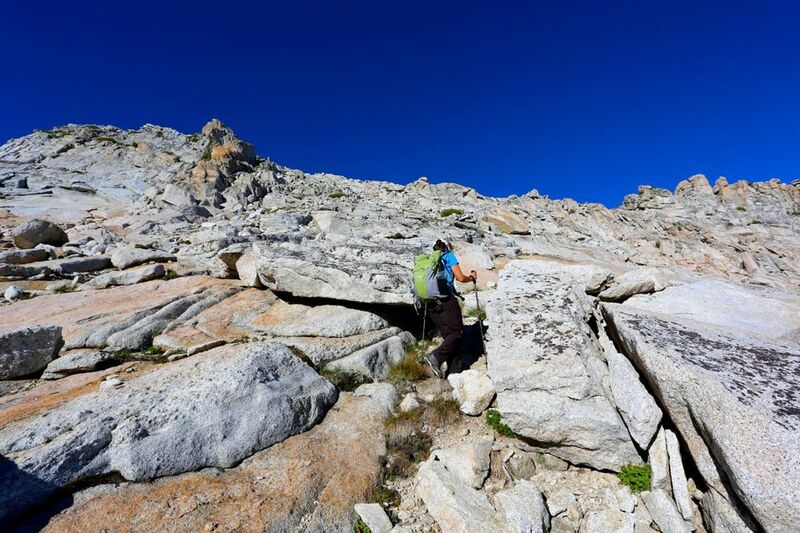 The hike from the saddle to the summit is rocky and sometimes steep. The ridge is exposed to strong westerly winds, which can sometimes be an adventure. Even in summer, come prepared with warm clothes and gloves. Karen climbing a snowfield just below the summit. Agassiz Peak, Arizona's second highest peak at 12,356 feet, can be seen to the right. Map of the route up Humphreys Peak. Note that the trail locations are approximate only.